Pilot watches remain to be some of the most popular and recognizable types of timepieces available. The simplicity of the bracelet, coupled with the distinct character of the dial, makes it a very noticeable timepiece especially to the watch-loving community. To the untrained eye, this type of watch may seem too simple and utilitarian. However this design is intentional with pilots in mind, keeping them focused on the skies allowing fast glimpses for timekeeping. The undeniable charm, functionality, and uniqueness of these watches make them sought after. In this article you can find the best pilot watches under $500. Combining functionality and looks within a reasonable price range, these watches are sure to pique your interest. There are 2 main types of pilot watches: Classic and Modern. Both are pilot watches but have variations with regards to their functionality and design. Depending on your choice, both are recognizable wristwatches that present a unique type of watch. In a nutshell, classic pilot watches are those that look a lot like their predecessors. The design and overall appearance of these watches tend to resemble the original pilot watch during the war. They provide the basic functions of a watch but are a bit outdated with the current trend in modern timepieces. However, the classiness and design is not to be underestimated as they are fashionable. Initially there were only automatic watches available, but nowadays there are quartz variations as well. Very different from Classic pilot watches, the modern type focuses more on their functions. They are more complicated pieces that provide complicated features for a more functional timepiece. On par with current technological timepieces, modern pilot watches present impressive popular features such as very long battery power reserves, protections against scratches and magnetic fields, high water resistance, and possesses high-sensitivity WAAS GPS receiver. The dial usually has three sub-dials utilized as a chronograph. 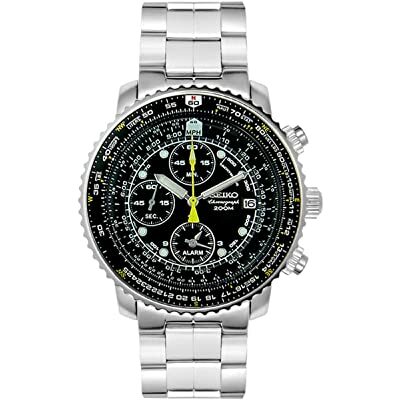 Bezel usually contains different functions such as a tachymeter for measuring speed or a slide ruler. Besides these functions, the look of pilot watches remain in. making them fit for true pilots and enthusiasts. The Laco Type A Miyota Pilot Watch proves that simplicity in design complements the owner’s style preferences when being worn. It is a classy timepiece meant to add charm to the wearer. It borrows the original design of pilot watches, the first of which were worn by the Luftwaffe of Nazi Germany. The design of the Laco Miyota pilot watch focuses more on the type’s original identity, featuring the iconic sword hour and minute markers and large Arabic numerals contrasted with the black dial. Holding the case is a brown leather band with metallic studs and white stitching at the sides. A buckle clasp finishes off the look. When worn, this creates a laid-back style for the user. Because of the Laco Miyota’s simplicity and boldness, it is best worn for trips that will emphasize the subtle charm of the watch. It can be worn daily for a stylish work day or it can be worn on formal events that will be complemented by the quiet nature of the watch. It is, however, not an ideal companion for extreme sporting as its interiors might get damaged. These are best worn in casual to formal gatherings to highlight your style while being classy on its own. It is not ideal for outdoor trips and active sports, as it is a timepiece meant for casual use. 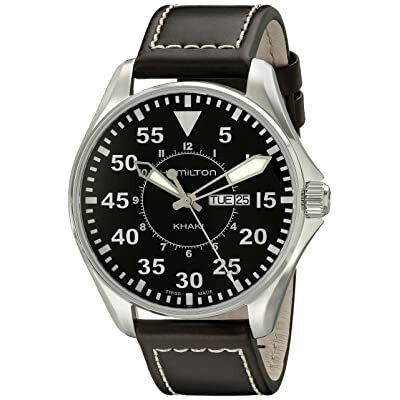 The Laco Type A Miyota Pilot Watch is a great representation of the original pilot watches. The design gives nostalgic elements and fits the daily wear and tear. If you want a watch for work and for meetings, then this is for you. The simplicity and charm of the watch adds up to your personal style and completes the look you want, giving more presence to your looks. Interested in Laco & German Watches? Check out more of them here! The Orient Aviator is a pilot watch that combines the good looks of a classis pilot watch with modern features utilized among current timepieces. This presents the core features of a modern pilot watch and fits everyday use. 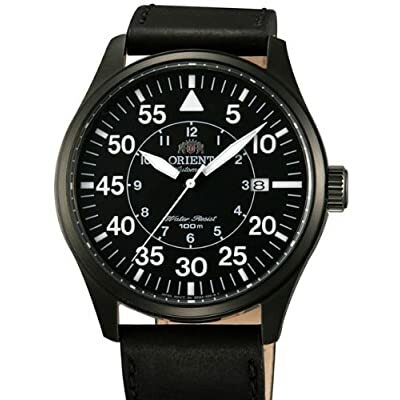 Overall, the Orient Aviator seems similar to classic pilot watches with regards to its look. It is simple and straight-forward, giving full style options to its wearer. It features a black dial with contrasting white Arabic hour markers and the iconic sword hands. A black case encapsulates these and is supported by a black leather band to finish off the look. Various features are presented with the Orient Aviator. It has a date window at the 3 o’clock marker. The sword hands are luminous so night adventures are possible. The large screw-down crown is a welcome design feature. Powered by the Orient 21-jewel movement, the watch is sure to provide accurate movement along its charming looks. The Orient Aviator is perfect for budding pilot watch lovers. It provides the basic features of a sturdy timepiece while keeping the nature and design of original pilot watches in mind. It is perfect for daily use and is capable of withstanding minimal exposure to water. It is charmingly simple and is perfect for most outfits. Providing a bit more color to the pilot watch is Citizen’s Eco-Drive. This timepiece takes you back with its appealing dial that is sure to catch people’s attention. The seemingly subtle watch is definitely one that steals a second look. As simple as a basic pilot watch it may look like, the look that it has turns heads. The Citizen Eco-Drive is definitely a great option for pilot watch hunting. It has the basic design of pilot watches taking inspiration from the mid-century looks that it had at that time. It features a black dial with unique, luminous minute, 12-hour and 24-hour markers for accurate timekeeping. The dial is enclosed by steel casing that is held together by a light brown calfskin band with contrasting stitches. For this type of pilot watch, it is best worn for daily use and occasional formal events. It goes best with light and active colors because of its hue and makes a great travelling watch as long as it doesn’t require intense physical activity. It may be hard to fit with sports attire as the pilot watch ultimately goes for the laid-back, everyday watch look. It features luminous hands that offer a good view for quick glimpses at night. Powered by quartz movement, the Citizen Eco-Drive is sure to deliver quality timekeeping in all aspects of the day. 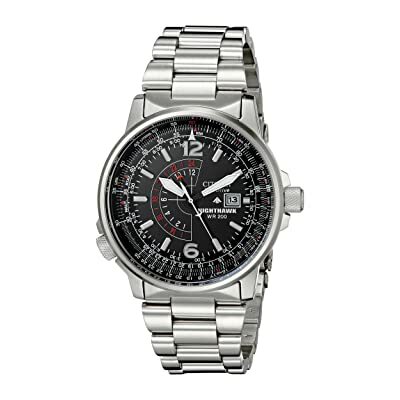 Citizen’s Eco-Drive is a good choice for a basic pilot watch that you can bring on your daily trips. The overall look of the watch gives a throwback to the 1950s designs, recreating a classic vintage feel that goes well with khaki and jeans. It can be matched with light colors and can also be brought on semi-formal to formal trips. Hamilton’s Khaki King is a great offer for a basic pilot watch. 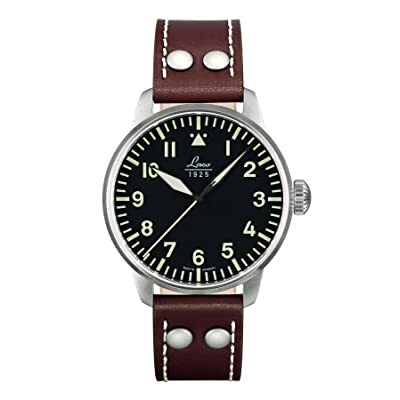 It has the classic pilot watch look and gives off a unique style with its overall dark tones. It is a simple and attractive watch that emphasizes charm with the wearer’s aesthetics. As a Swiss-made timepiece, you can also be sure of its precision in timekeeping. As with the old pilot watches, the Hamilton Khaki gives off the classic vibe that this type of timepiece encapsulates. It has a black dial with contrasting white Arabic minute and hand markers and large sword hands. A day and date feature is also included, located beside the 15-minute marker. A stainless steel case offers a break from the monotone. It is then wrapped up with a dark brown calfskin band. It is best used for daily trips to work. The simplicity and charm of a dual-toned watch gives it the charm it needs to complement almost any style preference its wearer would like. It can also be brought to formal events due to its dark color complementing the formality of such special events. It has some notable features fit for a classic timepiece. The day and date is a welcome feature to include. Luminous hands make night travels easier. A scratch resistant anti-reflective sapphire crystal helps protect the timepiece. It also has the assurance of a Swiss quartz movement, having strict quality control for maximum performance. The 200m water resistance is a great addition that helps protect it from rain or accidental dips underwater. Hamilton’s Khaki King is a beautiful pilot watch that offers a lot of protection for a seemingly basic timepiece. It is suitable for a lot of style options due to its tones and can be brought to various places due to its scratch and water resistance. It is perfect for fans of Swiss-made watches due to its accuracy. If you want a stylish fit-for-all timepiece then this is a great option. Citizen’s Nighthawk offers another great example of modern types of pilot watches. Its metallic look is complemented by the various features it has as it can be brought nearly anywhere. The charm of the watch lies with its sleek and contrasting look, giving off a formal yet strong feel. The design of the Citizen Nighthawk is showy. It impresses with its stainless steel bracelet that instantly grabs attention. The dial is another story. Its black dial gives a lot of room for contrasting elements for the hands and markers of the timepiece. It grabs attention to its multiple features that both aeronauts and watch enthusiasts would surely love. There are various features that makes the Citizen Nighthawk a great choice. Eco-Drive technology helps it conserve battery as it is powered by light. It has large luminous hands for nighttime adventures. Low-light visibility also helps it be read easier. Low-charge indicator helps with keeping you informed of the watch’s status, and a power saving function helps prolong power for the timepiece. It has dual time shown at the inner part of the dial. A date feature is also included at the 3 o’clock side. The 200m water resistance also gives great water protection. The Japanese quartz movement is accurate and has a short time gain/loss of about 3 seconds after a few days. A slide ruler is included in the inner where calculations and conversions can be made on the spot. 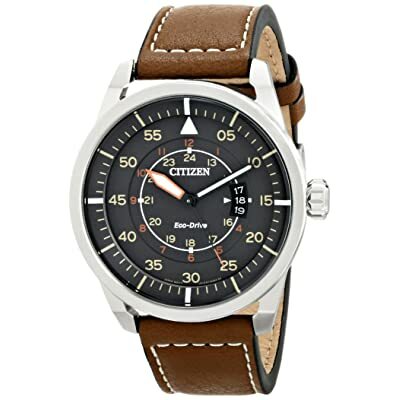 Citizen’s Nighthawk is a great timepiece for those who prefer a sleek and metallic design for pilot watches. It offers large luminous hands with low-light visibility, making it usable at night. With a distinct personality, this bold timepiece is for one who loves attracting attention. If you are a fan of Japanese quartz movement, then this fits the bill. It has great features included such as the slide ruler and a power-saving feature through the Eco-Drive that lets you use the timepiece for longer periods of time. The Citizen Navihawk is a unique pilot watch that is sportier than the rest in this list. It is a rugged and complicated looking timepiece that definitely begs a few glances for people to appreciate its design. It shows off tis charm with its impressive dial. Citizen’s Navihawk is a unique pilot watch. It is designed with activity in mind. A heavy-duty modern timepiece, its first impression is that of an outdoor watch. The polyurethane band is a noticeable feature that highlights the personality of its owner, effectively amplifying the style you opt to go for. It is best used for travels. Outdoor adventures, trekking, marathon, biking, and other active trips make best use of this pilot watch. It is also fit for daily use, but must have specific conditions met because of its dark color tones. It is not suitable for formal wear and events due to its ruggedness. 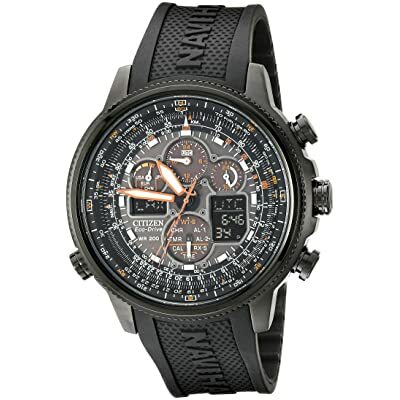 The features of the Citizen Navihawk make it worth more than it initially looks. It is powered by Japanese quartz movement, assuring accurate timekeeping. It has a power reserve feature and is light-powered, coming from Citizen’s Eco-Drive series. Luminous hands make viewing time a bit easier especially when it’s getting dark. A perpetual calendar and 2 alarms help with marking time. Atomic timekeeping technology synchronizes time for up to 43 world cities. It has an inner slide rule that helps with calculations. With multi-function chronographs and digital information displays, it offers a power reserve indicator, frequency scale, Digital city display, and UTC display. If you like a unique outdoor pilot watch that has a lot of features offered on the table, then this might be perfect for you. The Citizen Nighthawk is a rugged yet functional watch that makes it great for a lot of adventures but does not fit the description of everyday office watch. It may have a bit of limitations with style choices, but offers various functions that make you overlook the design limits. It has a reliable Japanese quartz movement for reliable timekeeping. The various digital displays allow more understanding of the watch regarding its power and other functions including a digital time display, frequency scale, and a chronograph. The Seiko SNA411 is definitely a modern pilot watch that leaves a statement. With its prominent dial, it offers multiple features that give light to the charming timepiece. With a stainless steel band, it gives the feeling of a sleek and complex watch. The appearance of the Seiko SNA411 is prominently charming. The polished stainless steel gives a strong vibe complemented by the bold dial design. It has a gear-shaped case that contains the dial featuring multiple sub-dials inside. The timepiece is perfect for semi-formal to formal events, but is also capable of complementing the daily look. It can match outdoor travels but may have some style limitations. There are multiple features packed inside the watch. The Japanese quartz assures quality movement. A chronograph efficiently keeps time when necessary, having 3 sub-dials for the function. A stopwatch can measure up to 60 minutes. Its alarm can be set for 12 hours, which can also double as a different time in another time zone. A date feature is a good addition as well. A 200m water resistance rating helps keep it going when accidentally submerged when travelling. It has a rotating bezel that can be used as a slide rule. It is also scratch-resistant, making it a viable companion for hikes. Seiko’s SNA411 is definitely a great modern pilot watch. It has a unique dial that gives a bold impression with its various sub-dials all enclosed inside the stainless steel bracelet. It is a fashionable timepiece that is perfect for special and formal occasions. However with its protection, it can also be brought on outdoor travels and adventures. For its interior movements, it is powered by Japanese quartz. The chronographs included are valuable features especially when used outdoors. Its alarm is great for meetings and the stopwatch can help you measure the amount of time something is done. The 200m water resistance makes this watch well-protected against getting wet. The Bulova Lunar Pilot is a special type of pilot watch as it combines the classic look of the timepiece with the complicated design that modern pilot watches have. It is a classy yet bold type of watch that creates a charming timepiece that can be brought on special occasions. Looking at the design of the Bulova Lunar Pilot, the dial will almost instantly catch attention. It is a beautiful timepiece that emphasizes the multiple functions housed inside the dial. Its black tone is contrasted by the white markers and hands, helping you see more clearly. A stainless steel case houses all these and is then held by a black leather band. It is a good watch for people who want a simple yet complex-looking watch. It can be used for almost any occasion, on daily work, formal events, semi-formal gatherings, and casual travels. It isn’t ideal for intense activities that require a lot of movement. 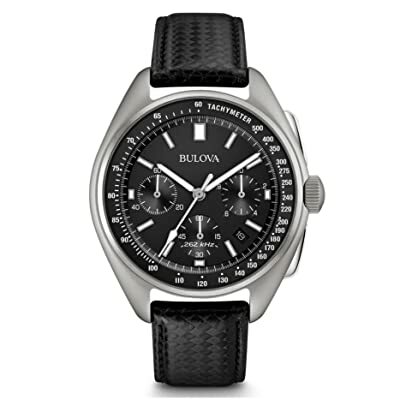 Bulova’s Ultra High Performance quartz movement assures very reliable timekeeping. It has a gain/loss of a few seconds per year, significantly more accurate than standard quartz which has the same loss for a few months only. It features 3 sub-dials for the chronograph and date. A tachymeter scale is included at the outer ring of the dial. Luminous hands also help navigation at night, helping keep you oriented when travelling late. The 30m water resistance gives ample protection against accidental spill from water. If you opt for a classic pilot watch with some added functionality, then this is a watch you should consider. The Bulova Lunar Pilot makes a good combination of both classic and modern, creating a timepiece that is suitable for a lot of gatherings. It can be used daily, or on special events depending on your personal style. The ultra-high performance quartz of the timepiece is definitely impressive. With a gain/loss of a few seconds a year, it is fitting for someone who relies heavily on time on their adventures. Adding the luminous hands, it fits overnight trips. The chronograph also helps with setting time for important events.